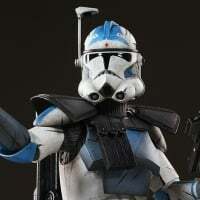 And secondly, I want the cross era heroes to go (at least in Galactic Assault) once we get all the heroes, I don’t if that’s going to be good, because for clone wars we’ll have 6 heroes, for the original trilogy we’ll have 10 heroes but for the sequel we’ll have only 4 but what I would like to ask is: does cross era heroes should go for all non-hero game modes or should it stay for the new large scale game mode? Another thing to mention is that in Galactic Assault the no cross era heroes thing could work if they still allow Chewbacca in the clone wars, Luke, Han, Leia in the sequels etc. Thoughts? I don't know about cross era in Conquest, I think they'll keep it as it is because some factions have quite a lot more heroes available than the other from that era (Resistance has 6 era heroes, FO only has two). Unless they altered it so only Rey and Finn were available for the Resistance, I think they'll just leave it as is. As for player count in Conquest - so far they've just said that they won't be increasing the player count, it'll stay at 40 in a game. I'm guessing there'll be AI soldiers running around too in that case, otherwise it feels like it will be a little empty (but that's with no existing knowledge of how the gamemode will function, they could make it work with just 40 players).